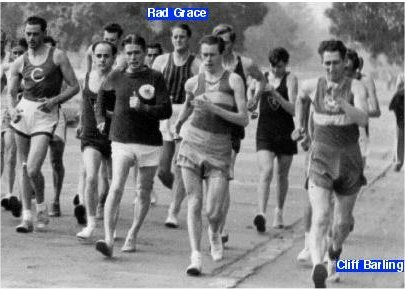 Rad Grace started his career with VAWC as a walker in the thirties but before that, he had walked in Tasmania. At one stage, he held the Tasmanian one mile walk record. A tall strongly built walker, he always stood out in the field when he walked. Being an accountant by profession, he accepted the position of club auditor at the Annual General Meeting held on March 31, 1941. Little did he know at that time that he would continue in this role for some 40 years. The Second World War interrupted club proceedings but when the club reformed in 1945, he once again signed on as auditor. He continued to race for some years but only at a social level. His professional life kept him busy - he became the Secretary of St Vincent’s Hospital. 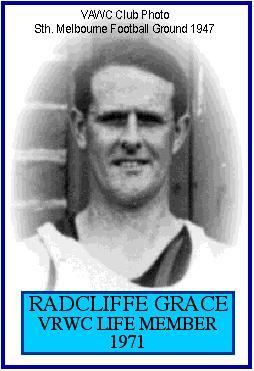 In 1971 he was awarded a life membership of the club to honour 30 years in this honorary role. He continued on for another 10 years and finally retired from this position in 1980. Few people have given the club service over such a continuously long period.